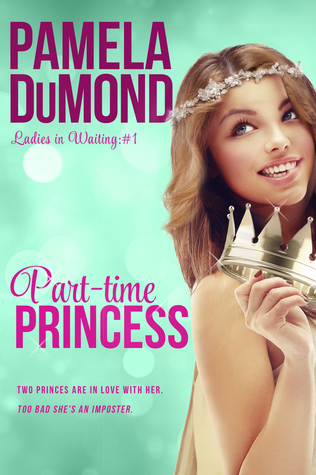 I was lucky enough to receive a copy of Part-time Princess by Pamela DuMond from the lovely folks of Mark My Words Book Publicity at NetGalley in exchange for an honest review. And honestly, this is one of the best books I have read so far this year. Lucy is a young woman who has recently lost her job and is struggling to find money to pay for the care of her only living relative when she responds to an intriguing job ad it leads her on a crazy adventure to the country of Fredonia where she finds herself impersonating Lady Elizabeth Billingsley. However, impersonating a royal isn’t all sunshine, lollipops and rainbows. Throw in a two handsome princes, some hysterical ladies-in-waiting, crazy royal relatives, an assassination attempt, an awkward wedding situation and you have a recipe for a great book! I did not know what to expect from this book other than the fact that I thought that the short premise I had read of it was interested. I did not expect to adore this book as much as I do. I completely got wrapped up in the fictional world of Fredonia and all it’s dramatics that ordinary life seems so dull now that I’ve finished. Over the past few days, I’ve developed such an emotional attachment to all of these characters. From Mr. Philips to the fun and fantastic Ladies-in-Waiting who always provided a giggle. I’m met with is deep sadness that my time has ended with them…for now. The comedy was always spot-on and never failed to make me laugh. Part-time Princess also never failed to keep me on my toes. Packed with twists and turns and royal dilemmas, it makes for a thrilling read. The romance was everything I expected it to be and more. It never felt like an over the top love triangle, probably because it never was. It’s evident which Prince of Fredonia has Lucy’s heart and much like her, I spent some time swooning over Nick too. Often shouting at the pair to just forget her royal obligation to marry Cristoph and waltz off into the sunset. If only life for our part-time Princess was that easy. It’s definitely one of my most entertaining and beautifully written books I have read so far in 2015. With compelling characters, laugh-out-loud comedy and a dose of drama, Part-time Princess is the perfect book for royal enthusiasts and romance lovers alike! I definitely suggest you pick up a copy. You won’t be disappointed.